This Applet will help you interconvert, tidy up and validate ISBN-10 and ISBN-13s (sometimes called EANs (European Article Numbers)) ISBN (International Standard Book Number). It tidies them into standard form with the dashes in the correct places (the rules where they go are quite complicated). It also validates the group number and the check digit. Just paste the raw ISBN-10 or ISBN-13 into the top raw box, click Tidy then copy the tidied ISBN-10 or ISBN-13 from the bottom boxes. A tidied ISBN looks like this: 0-9600688-8-0 or 0-13-625666-X or 978-0-00-000000-2. The amanuensis is also available with Java source to download. When you run ISBN Amanuensis as an application, it is even more automatic. You don’t need to do manually paste and copying. Just click Paste to convert the current contents of the clipboard. The tidied ISBN-13 replaces the old the raw text clipboard contents. This automatic feature is not available in the Applet version because the Applet sandbox considers it a security risk. This program also handles the new Bookland EAN-13, 13-digit, bar-code ISBNs. It handles both 10-digit and 13-digit ISBNs. All it does is prepend 978- to the old number and recompute the check digit, e. g.
ISBN-13 numbers that start with 979 don’t have an ISBN-10 equivalent. This program displays both the ISBN-10 and ISBN-13, with dashes in the right place, given either, The new Bookland EAN-13 check digit is computed in an unusual way with mod 10 and weight 3. This means the 13-digit ISBN numbers are always purely numeric. There is never an X check digit as there is sometimes with the mod-10, 10-digit ISBNs. 10-digit ISBNs and 12-digit UPCs (Universal Product Codes) are being unified as 13-digit EANs. for the current version of ISBN Amanuensis. 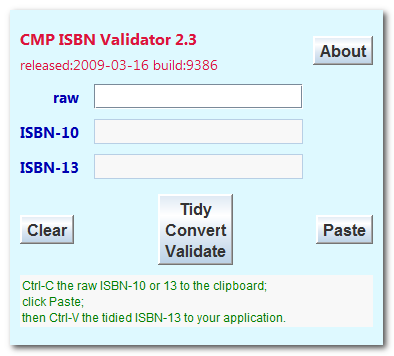 Applet to help you tidy, convert and verify ISBN-10 and ISBN-13 numbers used to identify books. Inserts dashes in the correct places and validates the check digit. It works even more simply as a downloadable application. ISBN stands for International Standard Book Number. 548K zip for ISBN Amanuensis Java source, compiled class files, jar and documentation to run on your own machine either as an application or an Applet. access isbn source in repository with [Tortoise] Subversion client on wush.net/svn/mindprod/com/mindprod/isbn/. download ASP PAD XML program description for the current version of ISBN Amanuensis. ISBN Amanuensis is free. Full source included. You may even include the source code, modified or unmodified in free/commercial open source/proprietary programs that you write and distribute. Non-military use only.